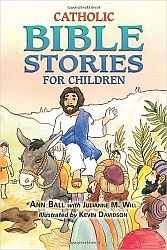 Catholic Bible Stories for Children is a fun, faithful and fully Catholic book for kids. It presents the word of God in a lively, yet reverent tone that captures the imagination and the spirit of children. Young ones will be introduced to lessons necessary for Faith formation. Bright illustrations help reflect the positive message of God's love in the stories of Saints, Psalms and signs of our Creator's care.